Variety has posted some of the details on the next Transformers cartoon now that Transformers Prime is done. Called "Transformers: Robots in Disguise", it will debut sometime in Spring 2015 with a new voice cast. 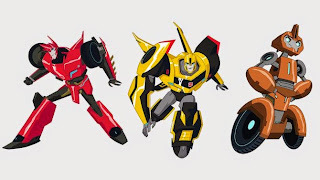 Darren Criss (Glee) will voice Sideswipe, Mitchell Whitfield (TMNT) will voice Fixit (that brown robot on the right) with Constance Zimmer (House of Cards) and Ted Mcginley (Married with Children) voice other characters. The show is set in the same Transformers: Prime universe but several years later "when Bumblebee is summoned to save Earth from a new faction of Decepticons and assembles a rogue team of young Autobots that includes a rebel bad boy bot, an elite guard cadet, a bombastic Dinobot and hyperactive Mini-Con to capture their new enemies." Hasbro is expected to provide more details at the Licensing Expo that takes place from June 17-19 in Las Vegas. The show's logo that matches the simplified look that is on the Transformers 4 toy packaging. There's been many movie and TV series with name used in later adaptations. This looks terrible. Looks like animated. That was the worst one. Prime has been the best by far. Already simplified the toys. Looks like we are headed for preschool aged audience. I thought that was what Rescue Bots was for. Disappointed already. So Bumblebee takes the helm in this one. I guess it's because he's still one of the favorites of most TF fans. Sideswipe looks like he could be Knock Out and I'm assuming Fixit will be the medic.